We will take part in Milan at the Fall Design Week first edition! After the great achievement that we had with our Endless shelves at the HOMI Design Competition, our last creation is ready to be shown in the first edition of the Milan Fall Design Week! HOMI Design Competition 2016 is among us and, as we announced, we will be there with our new Endless creation. Everything is ready and this special project is about to be revealed! Are you ready? Here we are on Suite! The international magazine Suite, a milestone for architects, designers and hotel managers, wrote an article about our factory and about our beloved Curvy bookcase! We will take part at the HOMI Design Competition 2016! Cooper and Flai are now also extendable! News in the house! 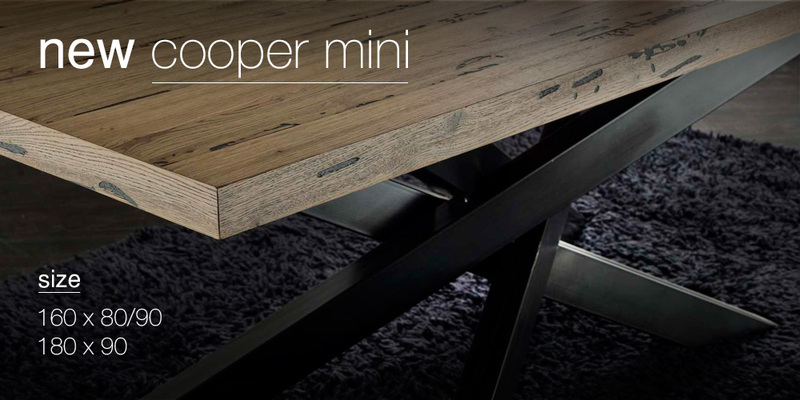 Our tables Cooper and Flai are now extendable! Is it now possible to make an extendable version with 1 or 2 extensions, one on the left and one on the right. La rivista holz-zentralblatt parla di noi! La Formenti Arredamenti da Cabiate (Como) ha fatto nascere nel 2005 il brand “milanomondo”, in modo da fondere il potenziale della produzione artigianale con un’arte orientata al design. Arredamenti Diotti A&, based in Lentate sul Seveso, Italy, is our shop of the month!